"But, dad said I could!" Some version of these words has surely reached every parent's ears. Children begin testing their boundaries from a very young age, providing a united parenting front from the start is key. As nationally renowned parenting coach and licensed therapist Tammy Gold explains, "Different messages can be hard to process - a child doesn't know, should I listen to mom or dad?" Parenting styles range from uninvolved to authoritative and stem from a wide variety of experiences. Do both parents need to have the same parenting style to be effective? Tammy suggests, "Not always, but it is helpful to send the same messages to the children." Aligning different parenting styles is possible, according to Psychology Today. If, like many families, you find yourself in a partnership with different parenting styles, there are strategies you can use to finding a resolution and present a united front. Parents should always try to work out issues away from the children. Planning out responses to common scenarios ahead of time can help keep parents on the same page. Talking in private about individual feelings on certain topics and why you have those feelings will garner more understanding from your partner. 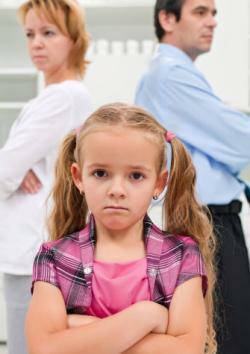 If an issue arises in front of the children at the time of a parenting disagreement, parents have two basic options. When possible, one parent can ask the other to step aside for a private conversation and discuss the issue quietly until coming to a resolution. The other option is for parents to speak with a child after the fact, explaining why they were wrong in giving an answer without agreement from the other parent. "It's wonderful to show children ways to communicate and how to recover from mistakes," says Tammy. Children learn by observing the behavior of adults, so instances of disagreement among couples can become great teachable moments. Each parent states why they feel strongly about something using examples from their personal experiences. For example, "My parents always made us adhere strictly to the rules, and I rebelled against them for it." Each parent offers up two specific ways he or she can compromise on the issue. Each parent create a list of fears for their child's overall well-being based on the other parent's current parenting style. Both parents then read their list to the other. For example, "I'm worried if we don't set limits on the amount of television Johnny watches, he won't do his homework and will fail second grade." Provide clear statements with specific timeframes, if possible, to explore what they are comfortable with. For example, "I would feel better if we did X, Y, and Z this year and revisit the issue when Johnny is older." Each parent provides the other with a list of three actions he/she can take to get on the same page. Create a list of the basic rules for the house as agreed upon by both parents. Post these rules in a common area and hold each other accountable for following them. Do some research. There are hundreds of published studies offering up scientific evidence for what the rewards and consequences of each parenting style are. "You have to inherently trust and feel safe with your co-parent," Tammy advises. Her work with families is based on the principles of Attachment Theory, which basically states that a child's life is defined by their first couple years of life. During these formative years, it is important for both parents and the child to feel safe with the ones they love. Some of these changes may be very difficult to process as people need time to work through their feelings. Household changes may not happen instantly, but parents need to make these discussions occur. Left unresolved, parenting style differences can have lasting effects on both parents and children. Parenting style differences are among the top reasons for divorce in the U.S. It is important for couples to discuss such important issues before having children to avoid confusion and tension in the future. Some parents don't discover how different their parenting styles are until they are already rearing children. In this case both parents can benefit from assessing their own parenting style and role-playing common scenarios. Inviting the help of a parenting coach or a therapist can help parents to better understand each other. Tammy notes, "When parents are better connected and clear, the whole family is happier." Problems with conflicting parenting styles within a household are common. There are many solutions as well as practical strategies parents can employ to resolve these issues. Using Tammy's tips, parents are sure to find some common ground and play on the same parenting team.